Fu, Wanyi Carbrello, Christina Wu, Xiaosong and Zhang, Wen 2017. Visualizing and quantifying the nanoscale hydrophobicity and chemical distribution of surface modified polyethersulfone (PES) membranes. Nanoscale, Vol. 9, Issue. 40, p. 15550. Armstrong, Gordon and Kailas, Lekshmi 2017. Hyphenated analytical techniques for materials characterisation. European Journal of Physics, Vol. 38, Issue. 5, p. 053001. Meyer, E., Josef Hug, H & Bennewitz, R. “Scanning Probe Microscopy: The Lab on a Tip”, 1st Edition , (Springer-Verlag, Berlin Heidelberg) (2004). Meyers, G., DeKoven, B. & Seitz, J. Langmuir 8(9 (1992) 2330–2335. Meyers, G., DeKoven, B., Dineen, M., Strandjord, A., O’Connor, P., Hu, T., Chiao, Y.-H., Pollock, H. & Hammiche, A. ACS Symposium Series 741(Microstructure and Microtribology of Polymer Surfaces) (2000), 190-211. VanLandingham, M., Villarrubia, J., Guthrie, W. & Meyers, G. Macromolecular Symposia 167(Recent Advances in Scanning Probe Microscopy of Polymers) (2001) 15–43. Belikov, S., Erina, N., Huang, L., Su, C., Prater, C., Magonov, S., Ginzburg, V., McIntyre, B., Lakrout, H. & Meyers, G. Journal of Vacuum Science & Technology B 27(2 (2009) 984–992. Su, C. Microscopy and Microanalysis 16(Suppl. 2 (2010) 364–365. 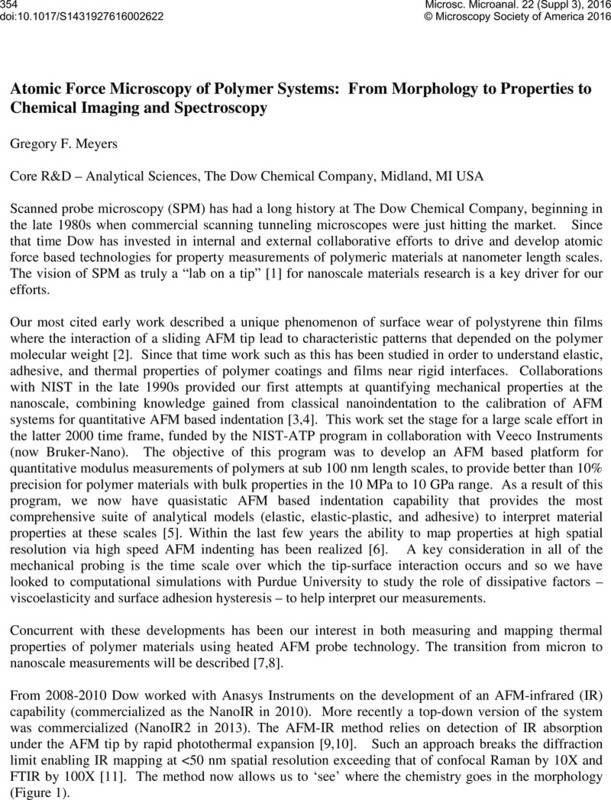 Meyers, G., Dineen, M., Shaffer, E., Stokich, T. & Im, J.-H. Macromolecular Symposia 167(Recent Advances in Scanning Probe Microscopy of Polymers) (2001) 213–226. Meyers, G., Pastzor, A. Jr. & Kjoller, K. American Laboratory (Shelton, CT, USA) 39(20 (2007) 9–14. Dazzi, A., Prazeres, R., Glotin, F. & Ortega, J. Optics Letters 30(18 (2005) 2388–2390. Meyers, G., Reinhardt, C., Felts, J., King, W., Prater, C., Cook, D. & Kjoller, K. 68th Annual Technical Conference - Society of Plastics Engineers (2010), 801-805. Dazzi, A., Prater, C., Hu, Q., Chase, B., Rabolt, J. & Marcott, C. Applied Spectroscopy 66(12 (2012) 1365–1384.